This tutorial will help you to export leads from WhatsHelp to any custom CRM. In order to integrate with the common CRMs, Google Docs or Slack we recommend using services like Zapier.com. Please, Please check our Zapier tutorial: How to get leads from chatbot into the CRM, Google Sheets or Slack. Every bot in Whatshelp has a webhook setting. You can give us a Webhook URL and we can push a new lead to it once bot finishes his work. 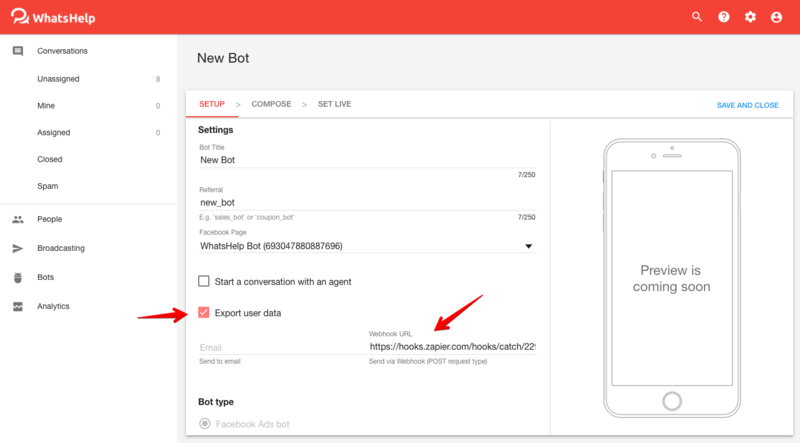 A webhook option can be configured on the first step of the bot setting by activating the "Export user data" checkbox and entering Webhook URL. Each webhook is an HTTPS POST request made to the URL that you provide in the bot settings. The request's POST body contains webhook information in JSON format. Note: WhatsHelp webhooks are sent with Content-Type: application/json HTTP Header, so please make sure that your service can handle such requests. If you have any questions, feel free to ask us at the chat.